One can literally feel a breather of relief that blew some fresh air in the Vienna city, 3 square kilometres densely packed with the executive offices for Austria's financial and economic upper crust. The Angst about more criticism on Austria's economic position after a broadside from the IMF 2 days ago gave way to new found optimism as the Organization for Economic Cooperation and Development (OECD) gave Austria fairly good marks in general, but issued 3 warnings in its latest report on Austria that probably apply to all other 190 countries in the world too and had also been an issue in the most recent BIS annual report. To keep Austria's perspectives in the right dimensions as this peaceful country can hide under a pinned needle on the global map I summarize the main points and the OECD recommendation bullet pointed in their own words. 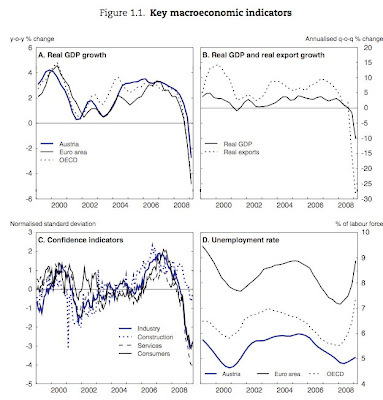 So far, Austria has weathered the global financial crisis better than other OECD countries. Even so, it is entering its worst recession in half a century. Moreover, its strong economic links with Central and Eastern Europe involve risks to GDP growth and financial stability. In the face of the crisis, the stance of monetary policy has been loosened in the euro area and measures have been taken in Austria to strengthen the liquidity and capital basis of the financial system, whilst automatic stabilisers coupled with discretionary fiscal measures also serve as a cushion. But the OECD recognizes that it may be in the very own interest of Austria (once the sixth-richest country on earth) to let the debt-to-GDP ratio of currently 62.6% grow a little further if this helps stabilizing declining employment figures. People I asked say Austria would also survive a debt ratio of up to 90% without major problems. 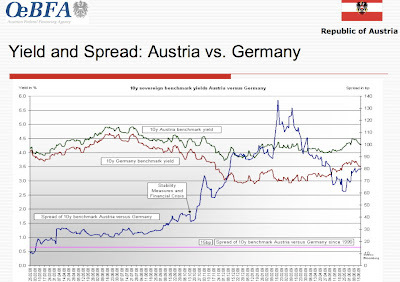 GRAPH: After a sharp upshoot of the spread between Austrian and (benchmark) German government bonds to a scary 135 basis points the Alpenrepublik has seen a rally and outlook is positive according to my sources. Chart courtesy of Oesterreichische Bundesfinanzierungsagentur. Click for larger image. As the Eurozone convergence criteria are anyway not sustainable in many other Euro members the EU should rather look into adapting these criteria drawn up in the sunny 1990s when modest but steady GDP growth appeared quite realistic and add a social chapter to the proposed text of the Lisbon Treaty I absolutely oppose. I may add that German Bundesbank officials were then fuming about these sunny sunday projections of Maastricht criteria off the record. While measures in Austria and abroad have been introduced to stabilise financial markets, further financial-sector support might be needed to deal quickly with downside risks should they materialise. Income maintenance should continue to be administered with a view to protect workers rather than jobs and in conjunction with schemes improving their longer-term employability. Nevertheless helping maintain existing jobs for a limited duration can be helpful in the current state of the crisis. Beyond the ongoing crisis, the economy will need to be put on a stronger growth path, and to regain the ground lost over the past decade vis-à-vis better-performing economies. There is room and need for policies to enhance both labour productivity and labour utilisation. Concerning the all important financial sector the OECD is not really up to date when I remember this master piece of Bloomberg writer Meera Louis that said Austria's banks will need €165 billion and not the €100 billion that are still the official figure for Austria's dire needs in the financial sector, a shocking additional €19,400 the finance minister will have to collect not only from tax payers but also their kids. 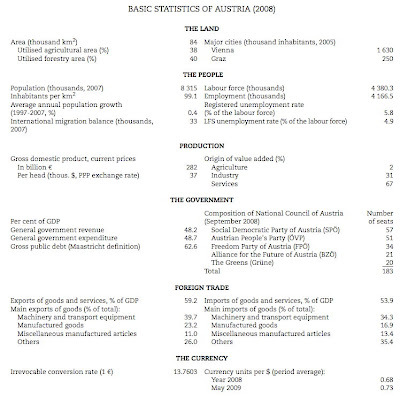 In addition to the monetary stimulus imparted by the Eurosystem, the Austrian authorities have introduced a €100billion (36% of GDP) package, including a top-up of the deposit guarantee scheme by €10billion, €15billion for capital injections in financial institutions, and €75billion for supporting interbank lending (via a new clearing bank) and for government guarantees of bank bond issuance. Covering the OECD's bleak outlook on the fiscal situation one has to complete the picture with Austria's disastrous demographic outlook that will force this micro-nation to roll out the red carpet for migrant workers in order to keep the rocketing share of retirees well fed and bathed in geriatric residences. First, the recent introduction of rolling four-year spending ceilings (which allow for cyclical spending on unemployment insurance and social protection) should help contain spending. Secondly, Austria has made progress with respect to containing ageing-related expenditure, especially on pensions. Nevertheless, efforts on this front should be maintained as risks and uncertainties remain high. Pension schemes for all civil servants should be fully harmonised, incentives for early retirement should be curtailed, disability pension schemes should be redesigned, a new sustainability mechanism for the pension system should be envisaged and health reforms should be implemented more resolutely. It is indeed difficult to understand that social democrat chancellor Werner Faymann defended the ridiculously low taxation of Austria's capitalists at the recent annual trade unions congress while the working middle class exceedingly turns into a working poor class because slightly rising nominal wages push them into higher tax brackets. Small and big entrepreneurs have their problems too as the tax office demands advance tax payments based on the absolutely wrong hypothesis that every business owner will see 10% annual growth in the next years. A more realistic approach would not only help small businesses - still the mainstay of economic activity - but could also lead to cost-saving reforms in Austria's bloated apparatus of public employees. I can see no economic sense when the tax authority first throttles business investments only to waste millions of man-hours to calculate the refunds that have to be returned because all companies look forward to the certainty of 5% less revenues this year. I may speak against my own interests but tax free capital gains after a holding period of 1 year and a 25% deduction on interest income and speculative derivative investments could certainly be improved to keep social peace. An extension to 3 years before one can collect tax free gains on his investments and both interest and speculative income equally taxed as salaries would not only curb speculation but also create a level playing field for workers and capitalists. Excuse me for not covering the certainly pressing issue of education but I can sit at only one table with my a.. - ahem, bottom.